You can easily import your business contacts and clients to InStream. To do that you need to create CSV file. The file can contain any type of information. In case there isn’t any system field which is accurate for the specific information you can always customize our system and create a new field. Notice: In the first row you should have the columns headings. 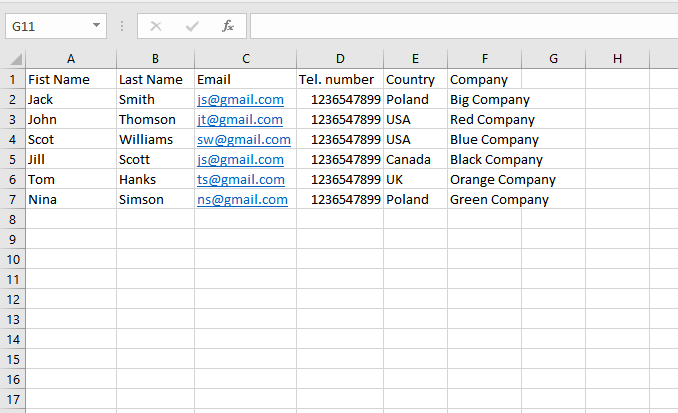 The first row will not be imported to the database as it is used to match the CSV file fields with the system fields. Click on your avatar in the top right corner and choose settings from the list. You can also enter setting by clicking here. Next, you need to choose a type of import. 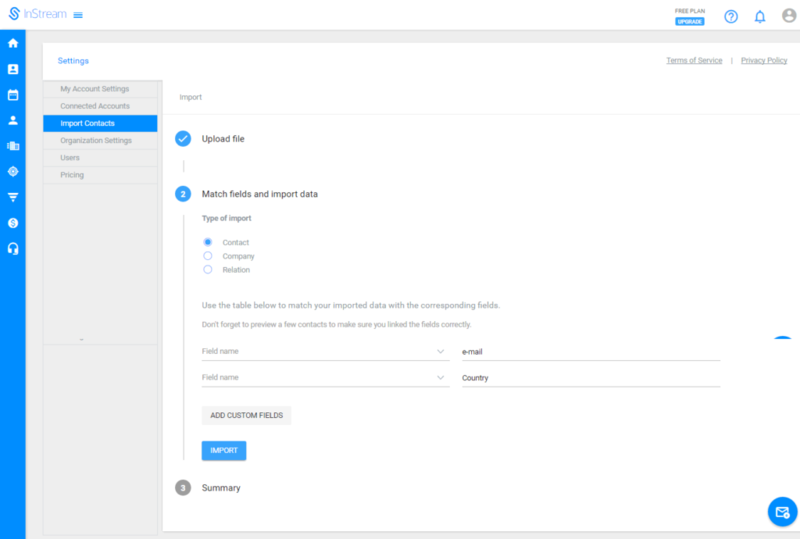 Contact – import contacts to the “people” tab. If the person is connected with any company, the person will be imported to the “people” tab and the company will be imported to the “companies” tab. Company – import contacts to the “companies” tab. If the company is connected with any person, the company will be imported to the “companies” tab and the person will be imported to the “people” tab. Relation – start monitoring your communication with imported contacts. The contacts will be imported to the “people” or “companies” tab, depending on the type of contact. Additionally, the system will create relations with these contacts to enable you to monitor communication. Then, link adequate columns from the file with InStream fields. On the left side, there are system fields and on the right side, there are CSV file fields. In the case there isn’t any system field, which matches CSV file column, you can create one. To do that use the “add custom field” option. Once you add new field it will appear on the left side. When all fields are matched you can proceed the importing process. The system informs you about progress and number of positively imported contacts. In case of any failures, the system informs about causes. In case you are facing some problems with importing your data from CSV file and you have tried to do that several times please do not hesitate to contact our customer success team via chat or by sending mail to support@instream.io. Can I import my notes? You can’t import your notes about your contacts. However, you can create your own field in the contact view and add the note you want. Why does the uploading files’ process stop at x%? Rows with empty cells or with not valid data (eg. with letters in numeric fields) might cause the problems. Additionally, some programs save CSV files in a problematic way for our algorithm. To solve this problem, open your CSV file in Google Docs and save it again. What is the maximum size of the file I can import? The maximum size of the file is 25MB.